Kendal’s local community has been having fun gaining new skills and increasing in confidence through recycling, thanks to £5,680 from the Cumbria Fund and the Cumberland Building Society Charitable Foundation. 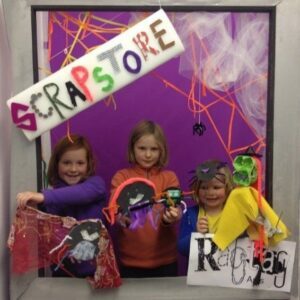 Ragtag Arts encourages local people of all ages and abilities to volunteer in their new Community Scrapstore. An ‘Aladdin’s Cave’ of materials and creative inspiration, the scrapstore gives its volunteers the feeling of worth, purpose, belonging and achievement, while promoting the importance of recycling in the community. Since the launch, Ragtag Arts now has well over 200 members, from all walks of life, using the store and benefiting from the workshops and resources. Ragtag Arts is part of a UK network of scrapstores and benefits from sharing ideas and resources with other scrapstores, regional and national ‘scrap swaps,’ and training and support from the ReusefulUK head office.